Hawaii's first stained glass mural. 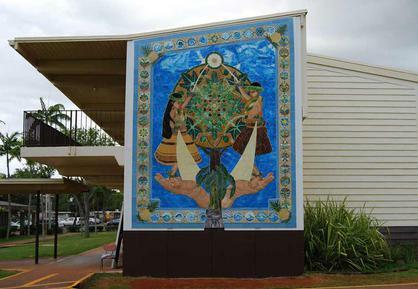 KIPAPA and THE PATH of LIGHT, 2014, (18’ by 14’), Calley’s first Hawai’i State Foundation on Culture and the Arts Art in Public Places commission, is Hawai’i’s first stained glass mural. Kipapa and the Path of Light is a significant new public art landmark at Kipapa Elementary School, the oldest elementary school in central Oahu. The mosaic was meticulously cut and fit Tiffany style by Calley’s stained glass partner, Master Artisan Lamar Yoakum, using the finest handmade glass that can be found in the world. When Calley couldn’t find the gold glass she wanted anywhere in the world, she designed her own fused golds. The focus of attention is the KUKUI tree, Hawai’i’s state tree ~ symbol of light, knowledge, and enlightenment. Above the tree is the Sun Medallion, The Source Star ~ the light, symbol of the source of life. 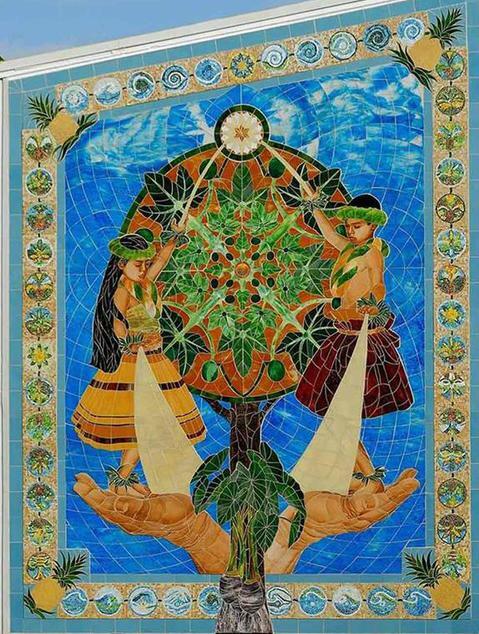 On either side of the tree of life, two young hula students (Kipapa alumni Hiapo and Ku’uipo Elisaga) stand on the hands of their elders’ (Uncle Herman Kenae) love and hard work. The children, who represent all the children, are connected to the Light, their ancestors and the land: Past, Present and Future. They are the conduits of their ancestors’ history as they create the future in the present moment. Their families are lifting them up higher than anyone has previously gone. They are connected to the water, the sky, the Earth and nourished by the kalo (taro), the culture, their ohana (extended family), school and community. The children are encouraged in their dreams, and supported to move steadily toward them. Nourished by Heaven and Earth, they thrive. Everything is possible if we believe it is, and act in accordance. The 15,000-piece smalti illuminated manuscript style border was made by 115 fourth graders and over 60 local adult volunteers under Calley’s direction to reflect the hands of community working together. Stained Glass Mosaic, 2016 Lilinoe, the waters of life, and the mighty koa have an important story to share. The waters that sustain your life do not come from the rain! They come from the clouds, which come from the forests. This mural is a call to action to rekindle aloha ʻāina and restore the forests and streams that bring forth the waters of life. Hahai nō ka ua i ka ululā‘au. — The rain follows after the forest. Destroy the forest, the rains will cease to fall, and the land will become a desert. The Artists in Residence Program was established by the State Foundation on Culture and the Arts in collaboration with the Department of Education to provide opportunities for students to work with artists to create site-specific works of art. Mahalo to Kamehameha Schools for the pre-mahele map, and Kumu Pūlama Collier of Kūʻau, Maui for the title and guidance throughout the project. State of Hawai‘i Department of Accounting and General Services.